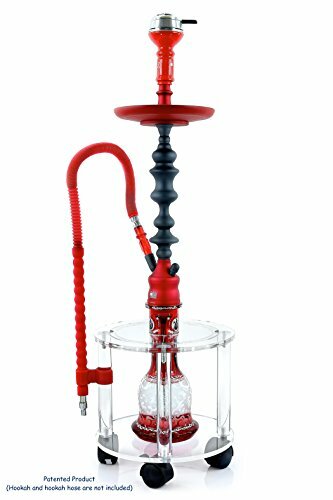 Click on the Add to Cart button now to get the best hookah stand, if not the ONLY hookah stand on the market today. LOOKS GOOD AND IS DESIGNED TO PERFECTION • The hookah stand mini dimensions are 12 Dim"x 12"H, it weighs 7.4 pounds and it's specifically designed for the best possible combination of stability, function and elegance. The hookah stand does not only function well, it looks great too blending into any room in your house as a great addition to your living room, family room or den furniture. STOP PARTY FOULS IN THEIR TRACKS • The mini Hookah Stand is made to tightly hold in place most standard (not the mini) Hookah shisha Nargila in place preventing them from falling over and burning your carpet or furniture, and letting you commit a "party foul" by knocking over your entire hookah pipe or piece and putting a damper on your smoking party. SET UP YOUR SMOKE PARTY IN SECONDS • The full assembly of the hookah can be inserted and removed in and out of the stand easily. The Hookah stand will also allow wide base hookahs up to 8" to fit in...so no matter how big or how small and you are sure to love our hookah stand to protect your investment, saving you money, trouble and the hassle of cleaning up after large messes. If you have any questions about this product by Hookah Stands, contact us by completing and submitting the form below. If you are looking for a specif part number, please include it with your message.